Wednesday April 13th 1881 We girls sewed steadily till three oclock. We went over town and Hatt selected her a cook stove. We were tired when we got home and did not do much of any thing in the evening. Weather cold and wintry Thursday April 14th 1881 We sewed all the forenoon and soon after dinner I went over to Aunty Walkers to fill some pillows for Hatt. I let May go with me as it was so muddy she could not go to school. After I came home I worked button holes in our new green dresses. Weather a little pleasanter. 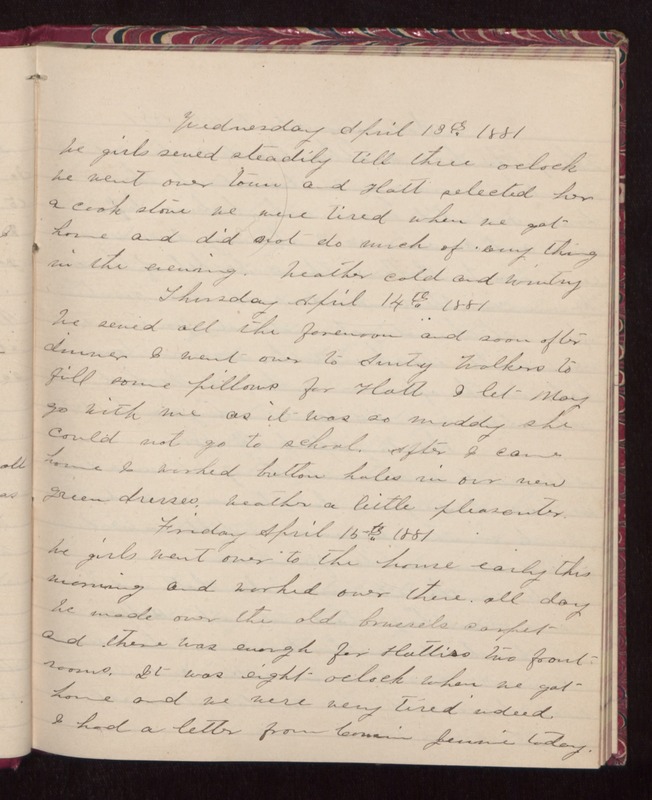 Friday April 15th 1881 We girls went over to the house early this morning and worked over there all day. We made over the old brussels carpet and there was enough for Hatties two front rooms. It was eight oclock when we got home and we were very tired indeed. I had a letter from Cousin Jennie today.